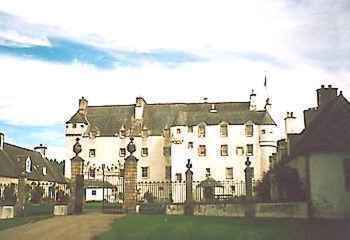 Traquair House was originally a substantial early 12th century defensible structure, founded by King Alexander I. Used as a royal hunting lodge, it was visited by many Scottish and English Kings and by the late 13th century, a fortified tower stood on the site. In the late 15th century Traquair passed to James Stewart who added, on possible 12th century foundations a stone tower house of three storeys and an attic. During the 16th century the main block was extended southwards and in the early 17th century, the 7th Laird of Traquair added the top storey, flanked by angle-turrets. The harled mansion assumed its present character in 1695, when the north and south ranges that flank the forecourt were added. 4 miles north-west is Horsburgh Castle and 10 miles south-west is Dryhope Tower. Traquair House is located south of Innerleithen, off the B7062. 13 miles south-east of Peebles, on the A72-B709. The site is owned by by the Maxwell Stuart family and is open daily, early April, May and September 11:00-5:00pm, June to August 10:30-5:00pm, October 11:00-4:00pm, Weekends only in November 11:00-3:00pm, for accommodation check website for details.